Although there have been debates about how smart vehicles may eliminate jobs for truck drivers, the truth is driverless trucks will not replace human drivers in the near future. Vehicle manufactures say that for at least the next decade, human drivers will still be needed at the helm of these vehicles while the technology assists with navigating through roads faster and safer. Such trucks are already in use in the mining industry in Australia and have proven to be extremely safe. These trucks will have a huge impact on many industries, including retail. Unlike human drivers, these trucks ensure safety and are programmed to find the shortest route and complete the journey in the shortest possible time which, in turn, will save time, fuel and overall costs. Improved safety: - Studies on road safety indicate that up to 90 percent of traffic accidents are caused by human error. Smart trucks are designed to make faster decisions under any traffic or weather conditions. They are equipped to navigate and respond immediately to any hazard that presents itself on the road. Fitted with an assisted highway tracking system, smart trucks are programmed to play it safe as they diligently stay in lane instead of swerving to avoid hitting something (such as a pothole), maintain a safe distance from other vehicles and stay within prescribed speed limits. Higher fuel efficiency: - As more driverless vehicles start rolling, traffic congestion can be minimized. Many technologies that will help to achieve this – like vehicle-to-vehicle communication – are currently in the pipeline and will enable smart vehicles to avoid busy routes, saving up to 15 percent on fuel, says a report on the topic by DHL. Fewer restrictions: - As there is minimum human involvement, time limit rules for carrying freight may also be relaxed. Trucks will be able to run all day and through the night to ensure faster deliveries. This, the report says, will reduce overall cost by 40 percent per kilometer. In addition, it’s predicted that the same amount of freight will be able to be hauled with nearly 50 percent fewer vehicles on the road. In fact, one German study predicts that by 2030 the volume of driverless truck transportation will increase by 39 per cent. Greener technology: - These fuel-efficient, fast-moving vehicles will not just save cost, but also reduce the carbon footprint by lowering emission levels. Other benefits: - There are certain other fringe autonomous functions that these trucks are programmed to do apart from driving. The DHL report points out the logistic-specific advantages. For instance, smart trucks could help in warehouse operations by automatically loading freight or through assisted order picking. Autonomous driving trucks can improve what is called the “least predictable part of the entire journey” which is the last mile delivery with technologies like parcel station loading and shared cars. However, the general public appears skeptical about sharing the road with vehicles that are equipped with automatic steering systems. A study conducted in the U.S. found about 60 percent of those surveyed believed that a human can make better decisions behind the wheel than a computer. So the way forward seems to be a mix of the best of both worlds. 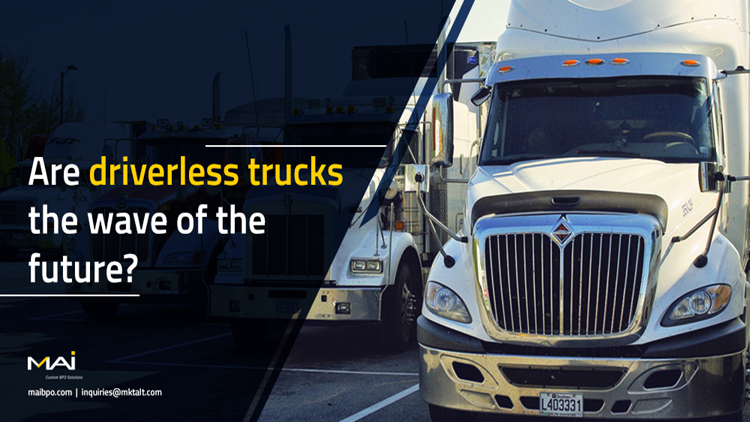 Despite the technical and regulatory hurdles, driverless trucks are the wave of future. They will dramatically transform the world of logistics and retail in a positive way. It’s really just a matter of time.